You may know that many people suffer from heart disease. However, you may not know that heart disease is the number one leading cause of death in the United States. Therefore, it’s important to know what puts you at risk for heart disease. This way you can work to prevent such risk factors and in turn lower your risk of heart disease. So, read below and find out how you can lower your risk of heart disease including reducing your risk of heart attack. A heart attack can occur when blood flow to the heart is blocked for one reason or another. Blockages in the blood vessels are usually caused by fat or cholesterol that form plaques. These plaques are like roadblocks that prevent blood from flowing to the heart well enough to deliver oxygen to the heart and in turn other tissues in the body. It’s when a plaque breaks off from the vessel and forms a clot that you can have a heart attack. This is because the clot stops blood flow in a vessel. Without blood flowing to the heart, this can cause muscle damage in the heart. That is why it’s so important to try and prevent risk factors of a heart attack to prevent this from happening. Here are some of the major risk factors that you can work on preventing today. High blood pressure: High blood pressure, or hypertension, can damage blood vessels over time, and in turn put you at higher risk for heart disease. High blood cholesterol and blood fats: High blood fats, also know as triglycerides, as well as high cholesterol can narrow arteries and increase risk of heart disease. Diabetes: Those with diabetes are have an increased risk of blood glucose levels rising. In turn, this puts them at higher risk for heart disease than those who do not have diabetes. Obesity: Since those who are obese are at higher risk for high blood fats, cholesterol, and diabetes, then they are in turn at higher risk for heart disease. 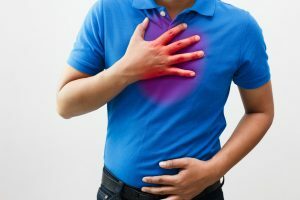 Family history of heart attack: If your sibling, parent, or grandparent has had a heart attack by the age of 55 years of age for men and 65 years of age for women, then you may be at increased risk yourself. Illicit drug use: Stimulant drugs like cocaine or methamphetamine can cause coronary artery spasms that can trigger a heart attack. An autoimmune condition: Those with conditions like rheumatoid arthritis or lupus are at higher risk for heart disease than those without such conditions. Lack of physical activity: Exercise, in particular cardio exercise like walking, running, or biking, can help to strengthen the heart. If you don’t exercise much, then your heart may weaken over time. Even if you can’t do a whole lot at once, start with a few minutes of walking here and there. Over time, try to work up to a total of thirty minutes most days of the week can be great for your heart health. Stress: When you’re stressed, this can increase your blood pressure. When you have increased blood pressure, it can cause damage to your blood vessels. Over time this can put you at increased risk for heart attack. However, it’s important to know that high blood pressure is not an accurate predictor for having a heart attack. If you notice any of the following signs of heart attack, be sure to call 911 right away. Notice that some signs and symptoms of women can be different from the common signs. Therefore, it’s important not to ignore any symptoms in which you just don’t feel right since they may be signs of a heart attack or other health condition taking place. You may not be able to prevent all heart attacks. However, there are some steps you can take today to lower your risk. Know your numbers: Visit the doctor at least once a year to check your cholesterol, blood pressure, and blood fats, so you can assess your risk of heart disease. When you know your numbers, you can take steps to prevent or treat a chronic condition. Quit smoking or don’t start: Smoking can narrow the arteries, increase blood pressure, and damage blood vessels over time. Therefore, if you smoke, visit smokefree.gov for resources to help you quit and in turn lower your heart disease risk. Start moving: Exercise more to help strengthen your heart and to manage your weight. Both of these benefits can help lower heart disease risk. Add a heart healthy supplement to your routine: If you are having trouble lowering your cholesterol, then try a heart healthy supplement like Alestra by Vita Sciences. With ingredients like niacin and plant sterols, this vegan supplement helps promote healthy cholesterol levels and overall heart health. Change your diet: Along with any changes you make in your lifestyle to prevent heart disease, you should definitely look at your diet. Make sure you are eating enough antioxidant and fiber rich fruits and vegetables. These foods can help improve gut health, reduce inflammation in the body, and provide nutrient-dense, low calorie foods in your diet that can help to manage weight. The Mediterranean diet in particular has been shown to help reduce heart disease risk and prolong life.